SuperPhillip Central continues this busy day of content with a second review to lead us into the weekend. It's for a combination action/tower-defense game, Hell Warders for the Nintendo Switch, PlayStation 4, Xbox One, and PC. Let's check it out and fend off the warriors of Hell with this review. It's always entertaining when developers take a mishmash of gaming genres and combine them into one game. That's exactly what Anti Gravity Studios has done with Hell Warders, part action-RPG, part tower-defense game. The end result makes for a compelling enough game to stick with to the very end, if not one that reveals most of its tricks in its repertoire fairly early. Battles in Hell Warders consist of various waves, with the goal of using your character (from a choice of three types with different skills and attacks to them) and an assortment of troops to ward off attacking waves of Hell's warriors. 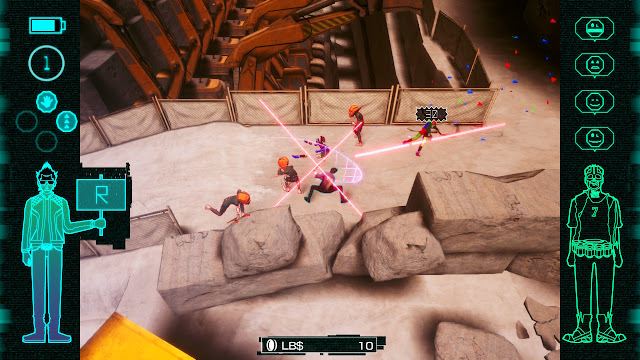 At the beginning of each battle, you get some currency to work with to purchase new troops to place around the 3D arena battlegrounds in real time, as well as upgrade their power. Once you're ready and raring to go to war with Hell's forces, the first wave begins. Troops come in the form of foot soldiers, archers, mages, catapults, ballistas, and more, and each is introduced one after the other per mission, of which there are five per area of the game--around 20 total. The more powerful the troop type, the more money they cost to place. You're limited by not only how much money you have to work with--though this is remedied by the fact that enemies do drop money as battles wage on--but how many different units you can have active on the battlefield at one time, and how many times you can strengthen them. There's definitely strategy in factoring in where to place units, what types of units to have, and when to strengthen them. This boss surely isn't going to play a game of croquet with its mallet. Troop and unit placement is important, as starting off in each map, enemies will descend onto the battlefield from several entry points. As more waves progress (you get small reprieves to gather resources and rebuild your army in between waves), new entry points are established by the enemy, resulting in needing to expand your troops and where you position them. The final mission of each area of the game features a tremendously powerful boss to take down in the final wave. These foes are large and definitely in charge, able to strike down your units as well as your own character with one to two blows. While your troops don't revive themselves, your character does--though it requires a ten second wait period to do so, and in a game with a focus on time and micromanagement, this can be a killer. Well, not as much as a killer as the rather difficult bosses to battle. One of the early battlefields in Hell Warders' campaign introduces a bit of verticality into the fold. Completing missions earns you artifacts that can be equipped to your character to present new bonuses in battle for different troops types. One raises the health of spearmen, while another boosts the attack rate of archers. You also earn beacons, up to five depending on how swiftly you complete a mission and how little damage has been inflicted on your crystal, which serve as means to boost the stats of your characters and troops. You can increase your character's attack, health, ability cooldown time, and improve your overall units' health, damage, attack speed, and more. Thus, there is an incentive to perform well in battles and replay them. 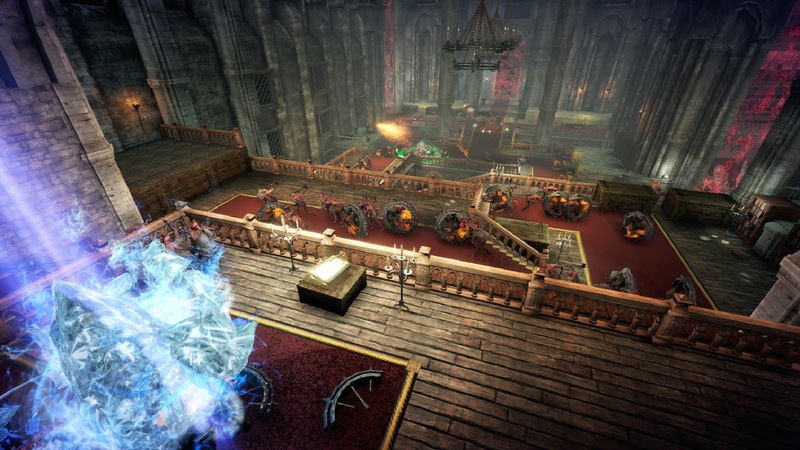 Hell Warders supports co-operative play for up to four players online, and really, it seems like the game was mostly built for that. Trying to multitask and micromanage later battles in Hell Warders' campaign gets to the point where luck becomes as much of a factor as skill when you're playing alone. The proverbial cards have to be stacked in your favor sometimes just to get a victory, which obviously isn't a problem when you have one or more other players helping you out against Hell's horde of monsters and demons. A bit more balance for solo players would have been greatly appreciated. Join forces online to ward off the forces of Hell together. Performance of Hell Warders isn't too terribly terrific. The Nintendo Switch build runs like a slideshow when an immense amount of monsters appear on the screen, and since this is commonplace in the game, this occurs multiple times every wave. 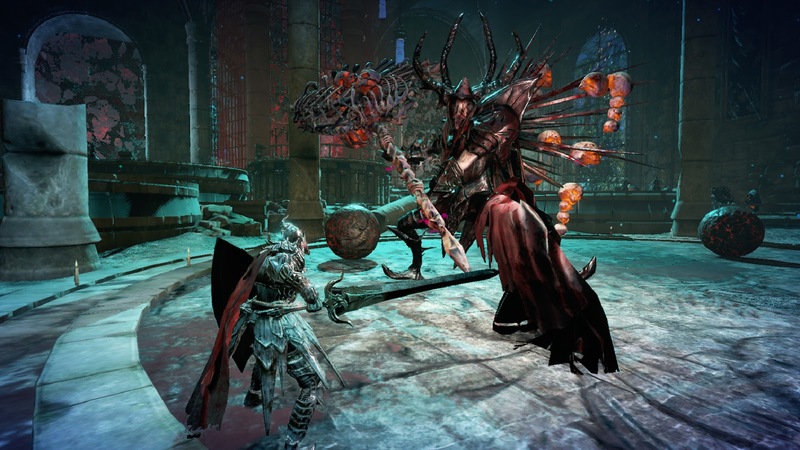 The art style is fittingly Gothic and gloomy, so if you're fan of drab and dull environments, Hell Warders has got your covered, as the game has a lot of those areas to battle in. The voice acting is quite forced, rarely getting above serviceable levels, and oftentimes being jarring at worst. Meanwhile, the music suits the game well with its forlorn on some occasions and other times bombastic score. Hell Warders shows most of its tricks early on within its campaign, but the tricks it does have are pretty solid. The balance of the campaign in solo play is off kilter by quite a bit, and the performance is less than satisfactory. It all amounts to a game that you'll be warding off not only Hell's forces, but also the occasional frustration here and there, too. The Nintendo 3DS is on its way out with Kirby's Extra Epic Yarn being the last currently announced Nintendo-published title for the system. While the majority of the gaming world has turned its collective focus to the Switch, SuperPhillip Central isn't quite right ready to say "goodbye" to the Nintendo 3DS. I'll have a review of Kirby's Extra Epic Yarn coming this month on the site. In the meantime, check out the launch trailer for the game that released today. 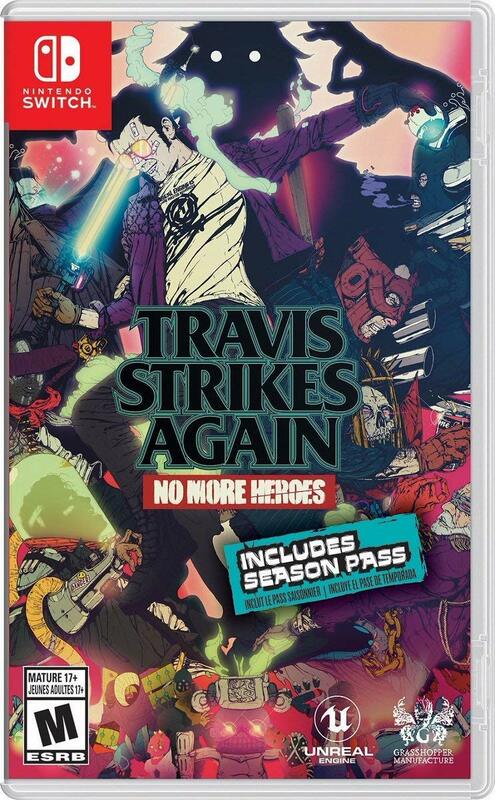 SuperPhillip Central kicks off March's month of reviews with Travis Strikes Again: No More Heroes, a side chapter in Travis Touchdown's continuing saga by Suda51. His games are generally a love 'em or hate 'em type deal, so let's see which end of the spectrum Travis Strikes Again: No More Heroes sits on with the SPC review. It's been almost a decade now since No More Heroes' Travis Touchdown last graced us with his otaku presence. Now, the wait is over, and he's back in a brand new game. But, don't think Travis Strikes Again: No More Heroes is a full fledged sequel. No, instead it's more of a side game that further expands the No More Heroes universe. After eliminating scores of assassins, Travis has settled for a more subdued life, hiding out in a trailer in Texas, playing video games, and just keeping on the D.L. However, when a revenge-seeking Badman discovers the location of Travis, the assassin who murdered his daughter Bad Girl, the two enter into an impromptu scuffle to the death right there in Travis' Texan trailer. Suddenly, the Death Drive MK II, a never-released prototype virtual reality gaming console, lights up and sends the pair of sparring assassins inside it. Drawing up a temporary truce to play through the Death Ball games, survive, and escape with Death Drive with their lives, thus our story begins in Travis Strikes Again: No More Heroes. He may not have a construction job, but Travis Touchdown is putting in work anyway. 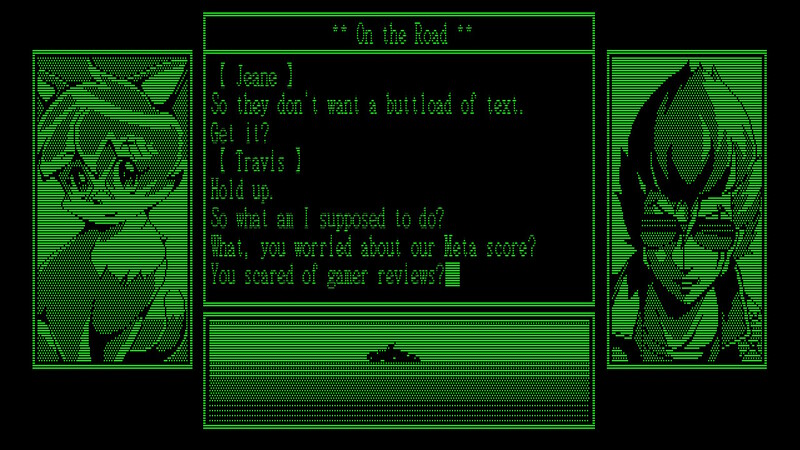 The six Death Ball games of the Death Drive MK II, the launch titles for the prototype gaming console, are the levels within Travis Strikes Again. 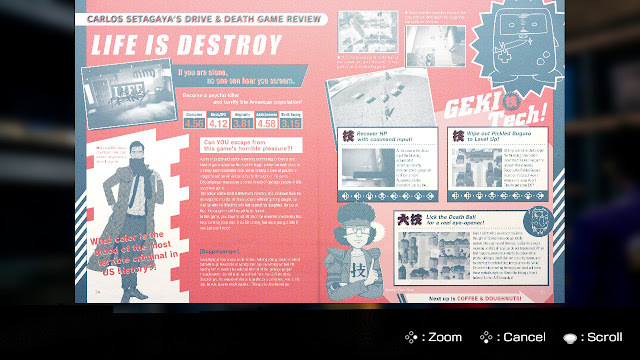 The scenarios are varied for each and you might partake in a different type of gameplay style here and there--such as Life is Destroy's puzzle-like neighborhood maps or Golden Dragon GP's drag races--the majority of the general gameplay in Travis Strikes Again is an overhead hack and slash. Life is Destroy takes a puzzle approach to its map design. Travis or Badman has a light attack and heavy attack to them--the former is great for crowd control while the latter is best suited for stronger enemies. Like in the standard No More Heroes games, using your weapon too much causes it to lose power, requiring you to power it up through shaking Travis or Badman's weapon. This is performed by pressing down the left stick and either shaking the controller or wiggling the right stick back and forth. As Travis and Badman attack foes, a circular gauge fills. Once full, you can unleash a destructive combo with a series of taps of the R button, perfect for taking down more sizable opponents in battle. The Bugstreet Boys are here with referential names like Spielbug and Zuckerbug. Along the way, an assortment of skill chips are acquired, able to be mapped to each of the four face buttons in conjunction with holding down the L button. Skills range from shooting a band of ball of ice to temporarily stun enemies to a gigantic beam from a satellite that wipes out foes with ease--though this requires a significant charging period. Speaking of charging periods, once a chip has been used, it takes a little while for it to charge and have the ability to be used again. The more powerful and beneficial skill chips take the longest to charge, understandably enough. Battles themselves aren't too deep, favoring style over complexity, which can result in a repetitive experience. This is especially so due to the rather limited enemy variety considering the 10-15 hour length of the game. Those that are well versed in the hack and slash style of gameplay will find Travis Strikes Again to be a fairly breezy game even on the Mild difficult, but the addition of harder difficulties ensures that there's a bit of fun to be had for everyone. The bosses are relatively easy to battle and beat, offering occasional flashes of clever design here and there as well. Still, it's quite the pleasure to discover their patterns and take them down with a skillful "A" rank. Travis is ready to tackle this boss in his fresh Hollow Knight T-shirt. All of this combines together for an assortment of battle encounters interspersed between light bits of platforming and the occasional ability to explore a little in levels. Make no mistake, though--Travis Strikes Again: No More Heroes is a mostly linear experience. Invisible walls block progress from interesting sights, and there is but an occasional side path here and there to venture to in order to discover one of the game's token collectibles. 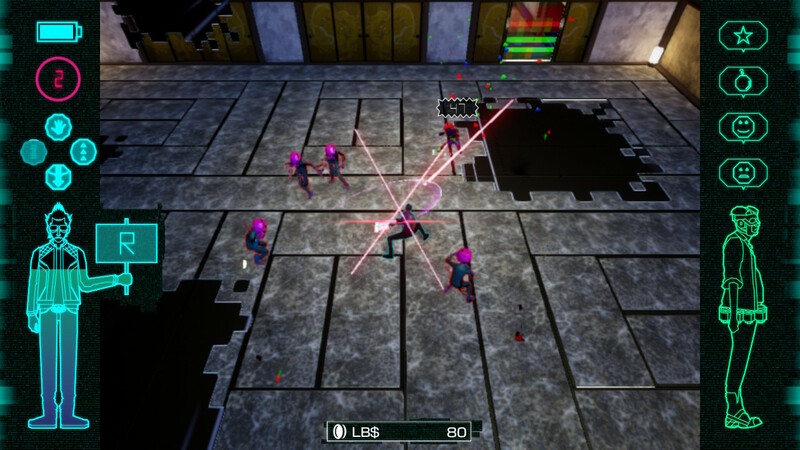 Additionally, the fixed camera results in some unwanted hits from enemies off screen, which can be quite vexing. Travis Strikes Again has a good deal of replay value to it. From finding all of the collectibles in levels to dabbling in the various difficulties and New Game+ mode, the game lasted me about just shy of 18 hours total. The additional DLC, such as the recently added Shinobu, make for even more longevity to the title. That's not even mentioning the drop-in, drop-out co-op play, available with two players and just two Joy-Con controllers. Travis Strikes Again is a game littered with references about the video game industry, such as fourth-wall-breaking jokes about localization, budget constraints, memory limits and more. Travis Strikes Again wears its references and humor proudly like a badge of honor on its chest, and while it heads into juvenile territory a lot of the time, this eccentric blend of bizarre comedy makes for an entertaining and surreal ride from beginning to end. A meta joke about Metacritic. How meta! 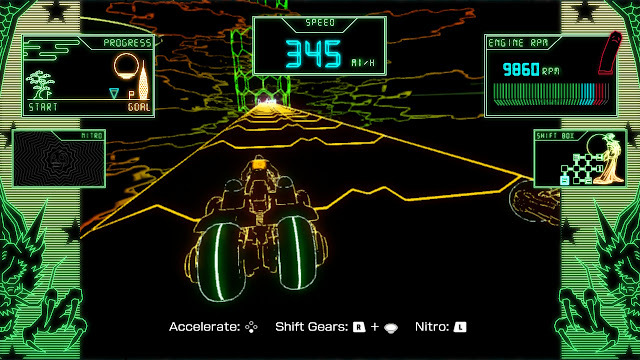 The ride is further enhanced by the visual style of the game, completing going all in on the classic CRT video game aesthetic. Things like the loading of games features buzzing and static, archives feature GamePro and Nintendo Power magazine-like tips, tricks and reviews on the Death Ball games featured, and even one game is unfinished and in development, literally in the form of an in-progress Unreal Engine project, complete with texture-less checkerboard floors and cones for where characters are placed--these things all make Travis Strikes Again: No More Heroes express its love of video games in a superb fashion. These odes to gaming magazines of the '90s could be mistaken for the real things--that's how good they are. This further exemplifies itself in all of the video game-related shirts that you can unlock for Travis and Badman to wear throughout the game using currency earned from levels. There are the blatant advertisements for the Unreal Engine--the engine Travis Strikes Again was made in, but there is also a vast assortment of indie game designs, too, such as Hotline Miami, Undertale, Hollow Knight, Brawlout, SteamWorld Dig 2, and many, many more. It's great to represent your favorite indie game out of the 40 or so featured in the game by having Travis or Badman wear them--though since the game is in a faraway overhead perspective, you seldom get to see the shirts up close when the action is going on. Golden Dragon GP is quite the drag--literally! 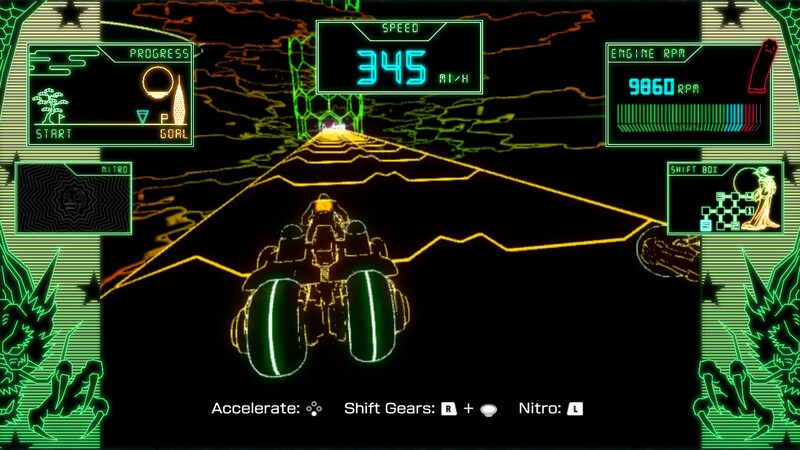 Pieces of the gameplay here are drag races. 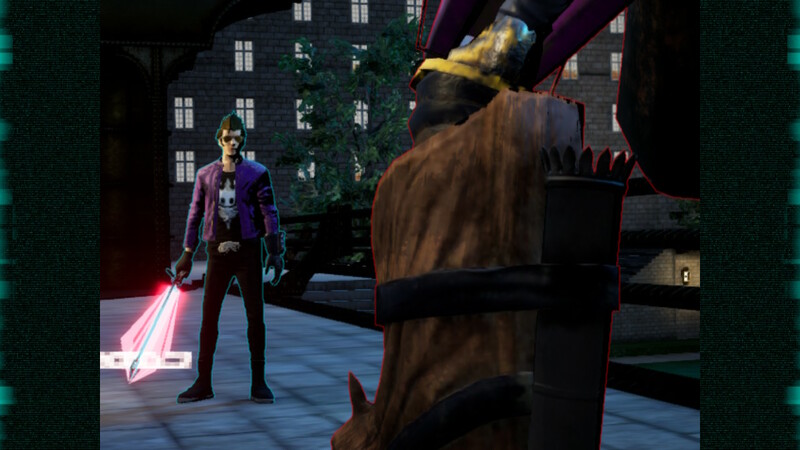 While not a meaty experience and more of a side course to the No More Heroes series, Travis Strikes Again is a worthy entry in the series that is bound to be a cult classic in the Switch's growing library. There are plenty of problems with the game--such as troublesome blind spots thanks to the fixed camera, a lack of polish, repetitive combat, and rather ho-hum level design--many of these can almost be forgiven due to just how creative, stylish, quirky, and so obviously full of heart Travis Strikes Again is. Note that I did say "almost". As is, Travis Strikes Again: No More Heroes is a reference-filled love letter to video games that has a multitude of small issues to it that do add up, but none that truly ruin the overall experience. Mortal Kombat 11 is but a month away, and WB Games has provided a brand new trailer for the game pertaining to the game's seemingly extensive story. It'll be interesting to see how in-depth the story mode of Mortal Kombat 11 really is when it releases next month on the PlayStation 4, Xbox One, Nintendo Switch, and Steam. As of this past Sunday, the Nintendo Switch is now officially two years old. With it we've seen no shortage of great games for the system, and that doesn't seem to stop anytime soon. However, before we look towards the future of the Switch, let's turn to the past--more specifically the top ten exclusives for the system of its first two years. While you won't see The Legend of Zelda: Breath of the Wild on this list due to it also being available on the Wii U, you will see a tremendous amount of quality in these titles--and maybe more Mario than you'd expect, too! We start out with a game I was pretty harsh towards when it originally released. 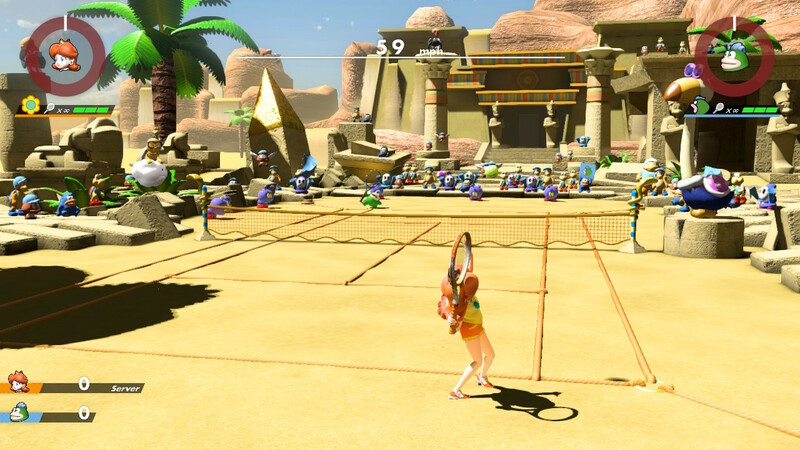 Now, since many patches and content updates (from where it was once unbalanced and missing essential features previous games had), Mario Tennis Aces is very much a game worthy of the Mario Tennis series name. 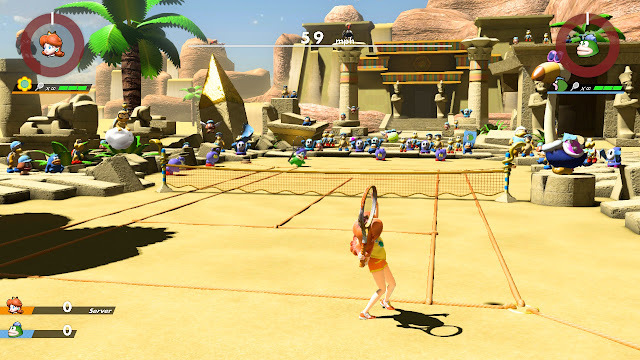 Whether you're playing a standard round of tennis or special Mario Tennis rules with power shots and the stamina gauge, Mario Tennis Aces brings with it some high octane, high adrenaline, high value entertainment. 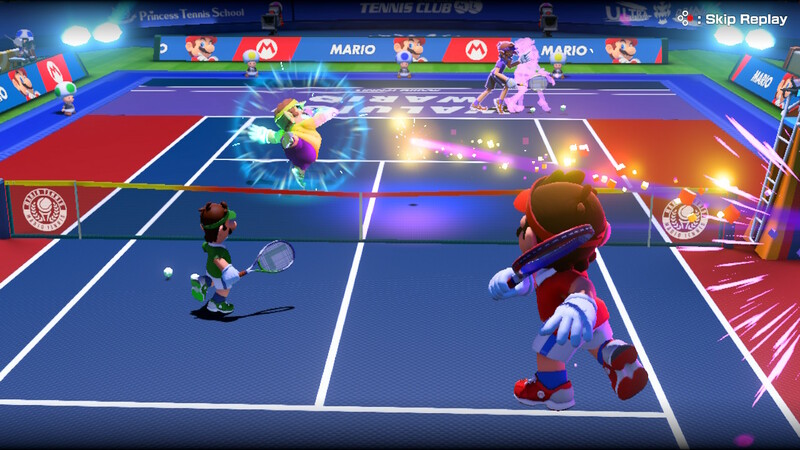 Since launch, new modes, an abundance of new monthly characters, and balance changes have made appearances all for free, making was what once a lackluster Mario Tennis game a rather excellent one. Party hearty, Mario and friends--and you're free to RSVP and join the celebration, too. 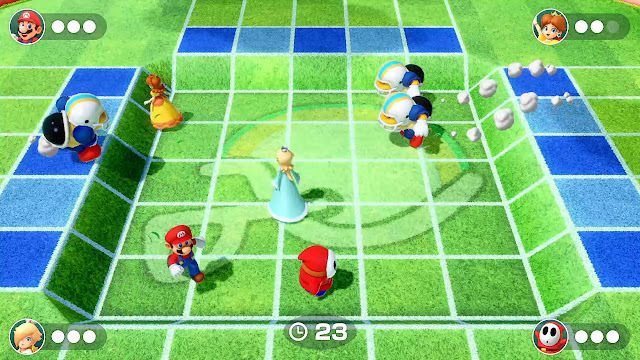 While lacking the typical amount of boards seen in previous Mario Party games, the four boards within Super Mario Party are fantastic to themselves, offering a lot of action for their size. One could argue that it's their smaller sizes that allow more events and action to take place! Containing around 80 satisfying mini-games, Solo and Team boards, a fun and engaging four-player co-operative River Survival mode, and much more, Super Mario Party brings enough goodness to in its [party] favor to make it one of the best entries in the series yet. 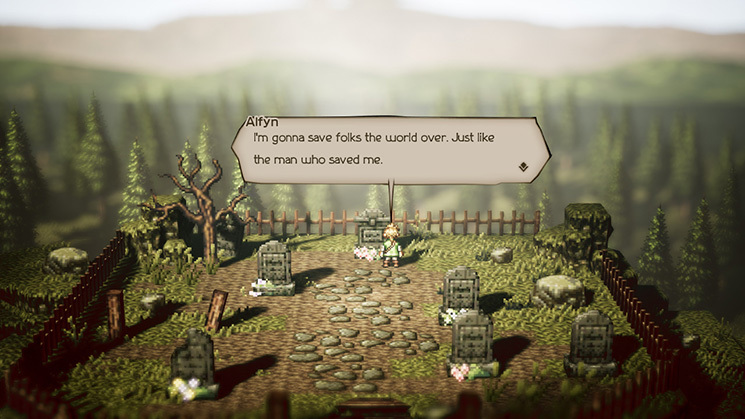 Shifting gears from parties to RPGs, Octopath Traveler is a gorgeous 2D sprite-based RPG from Square Enix that follows the story of eight travelers with their own unique vignettes and adventures. 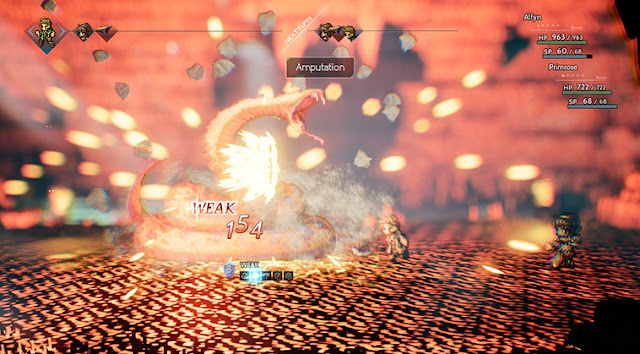 Octopath Traveler is obviously a looker with its unique visual style (your mileage may vary on how you like it--but I'm absolutely in love), but the role-playing systems within the game such as Boost Points allow a deep amount of strategy where you chain attacks to inflict the most amount of damage to enemies and assist your party members in the intense battles the game delivers. Throw in one amazing musical score, and Octopath Traveler strikes a fine balance between retro and modern that all RPGs fans need to experience for themselves. 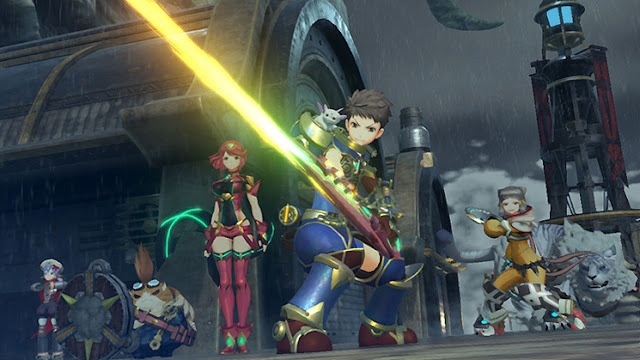 Continuing with the RPG theme we have going here, Xenoblade Chronicles 2 features a colorful and charming cast of characters, a collectible Blade system that becomes incorporated into battle, and expansive lands and areas to explore. However, these lands are teeming with indigenous and hostile wildlife, so explore carefully and cautiously! 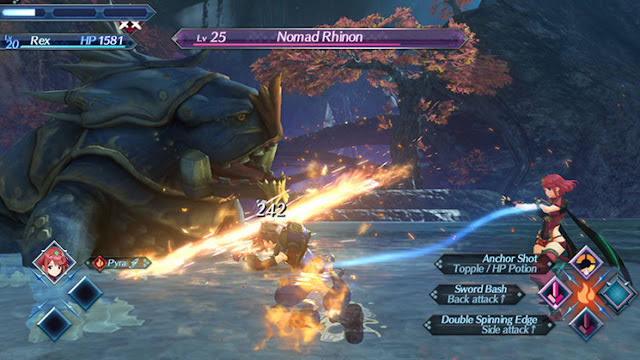 Xenoblade Chronicles 2 is quite the meaty game, offering a robust lineup of Blades to acquire and enhance, side quests to take on, and a main campaign that will take dozens upon dozens of hours to complete. 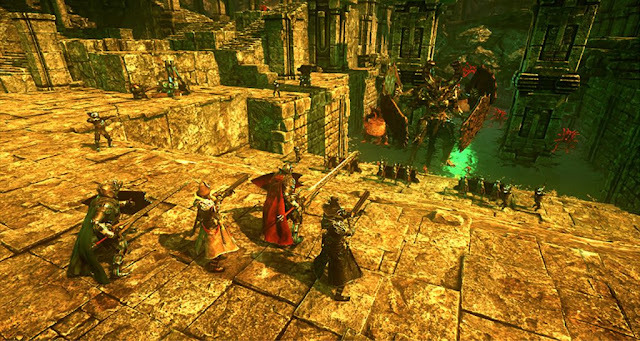 Though undocked performance on the Switch is a bit shaky, being able to hold a massive role-playing adventure like this in the palms of your hands is truly impressive, much like the overall adventure itself. 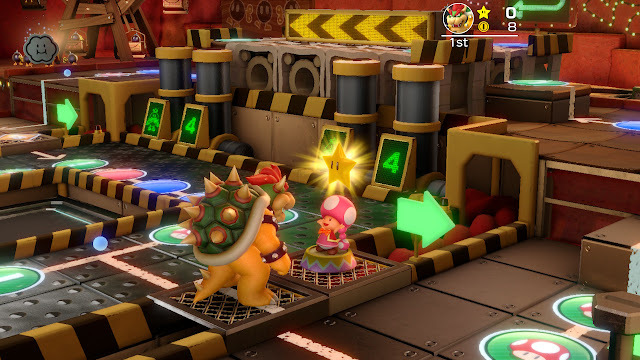 Take command of three Mushroom Kingdom or Rabbid characters as you launch them into strategical battles X-COM style! 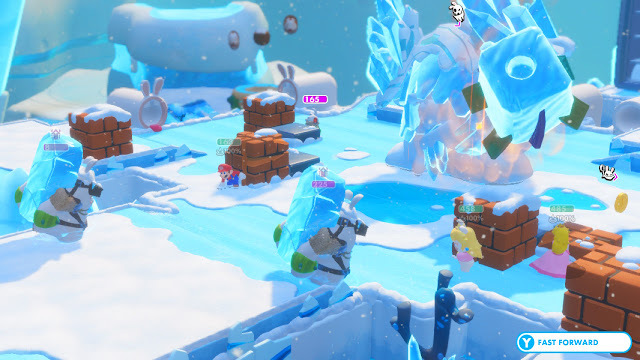 Really, that's what Mario + Rabbids: Kingdom Battle essentially is--X-COM in colorful Mushroom Kingdom clothing. The odds are stacked against you in battle, but with a smart strategy, the odds will turn in your favor. Explore interactive environments filled with puzzles between said battles, discovering treasure and chests along the way. The addition of the Donkey Kong-themed DLC make an already enticing package even more irresistible, as does the completely Grant Kirkhope-composed soundtrack. The idea of Mario + Rabbids: Kingdom Battle was laughable for many, but after witnessing the astounding quality of the game, it's Nintendo and Ubisoft that are laughing now--and players of this hilarious and charming game as well! Time to get wet and messy... with ink! What else did you think, you sickos? 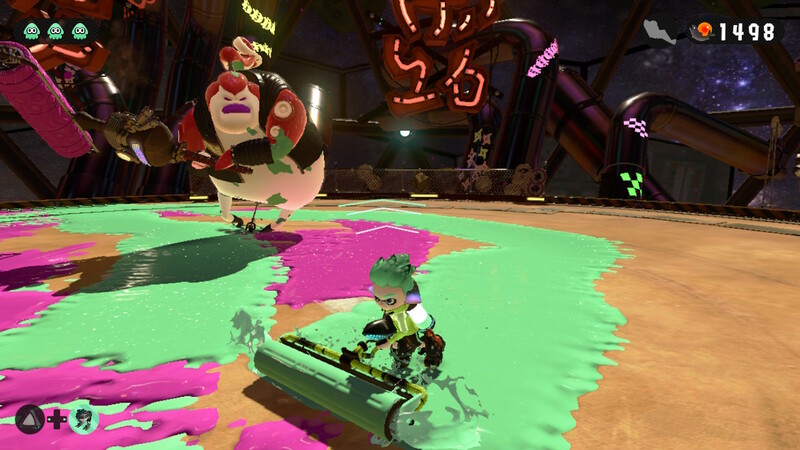 (...Or maybe it's I who is the sicko...) Nevertheless, Splatoon 2 features a full fledged campaign that puts Splatoon players in their paces with creative levels, rewarding scenarios and challenges, and some truly intense boss battles. 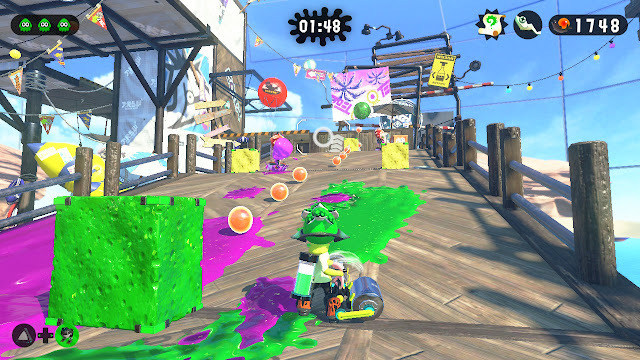 The multiplayer is just as messy and fun as ever with four on four skirmishes in ranked and unranked play across a regular rotation of maps, some returning from the original Wii U Splatoon. An all-new co-operative mode encourages teamwork against hordes of enemies and bosses alike, and while this mode isn't always available, it is quite special of a gameplay experience when it is live. Whether you're splatting to see who can paint the most ground in their team's colored ink before time expires (the main multiplayer mode of the Splatoon series) or deeply engaged in customizing your Inkling to your liking, there's a lot on offer and a lot to love with Splatoon 2. 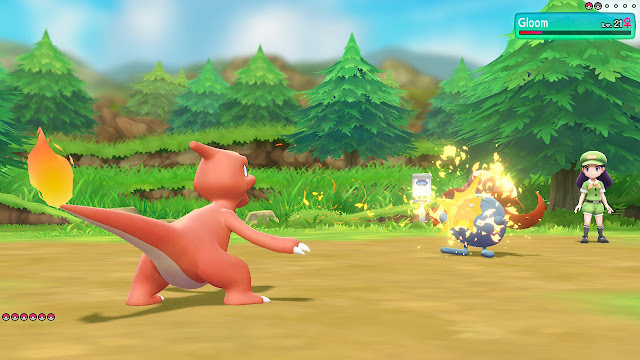 4) Pokemon: Let's Go, Pikachu! & Pokemon: Let's Go, Eevee! The duo of games that got me back into being hyped for the Pokemon series, Pokemon: Let's Go, Pikachu! and Let's Go, Eevee! 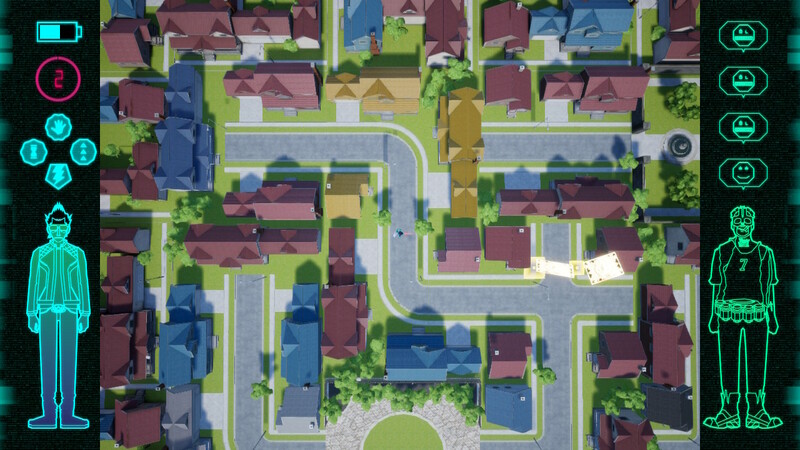 deliver a nostalgic trip through the Kanto region with some remarkable improvements. The lack of random battles makes searching for that rare, elusive Pokemon you wish to catch all the less tedious, and it also allows you to avoid battles when you desire nothing more than to evade that hundredth Zubat you faced in the original Pokemon Red, Blue, and Yellow games. 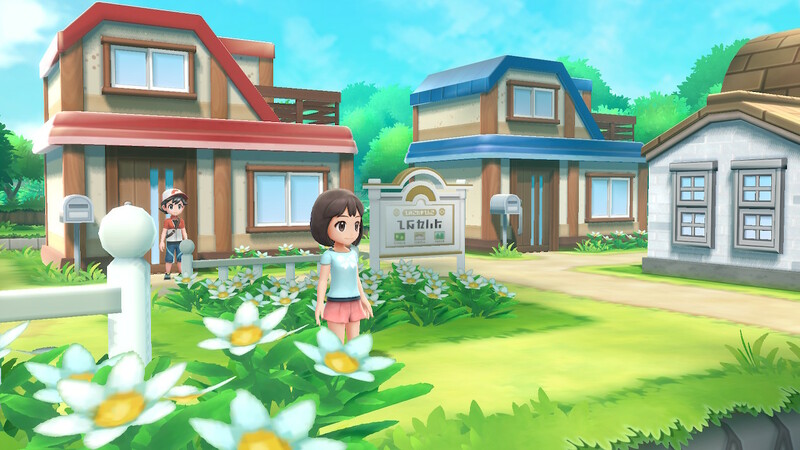 For new players, the Let's Go pair offer plenty to be excited over--from the accessible and friendly Pokemon GO-style catching mechanics to the easier difficulty. While these might put off longtime Pokemon players, there are plenty of traditional features available to them, and even still, the newly announced Pokemon Sword and Pokemon Shield are the main course for these players regardless! Now, this one might be cheating a little--or at least bending the rules a bit--but Mario Kart 8 Deluxe is the definitive version of Mario Kart 8, featuring more characters than the Wii U game, a brand-new Battle Mode, and several unique gameplay features and mechanics like auto-acceleration, smart-steering, and a new item. 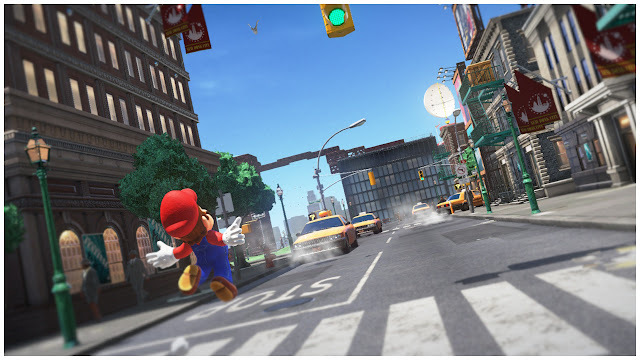 I argue that Deluxe is different enough from the base Wii U version of Mario Kart 8 to be acceptable for this list. And, it's really difficult not to want to put Mario Kart 8 Deluxe on such a list like this because it's just so bloody good. (Oh, I'm talking like I'm across the pond all of a sudden! 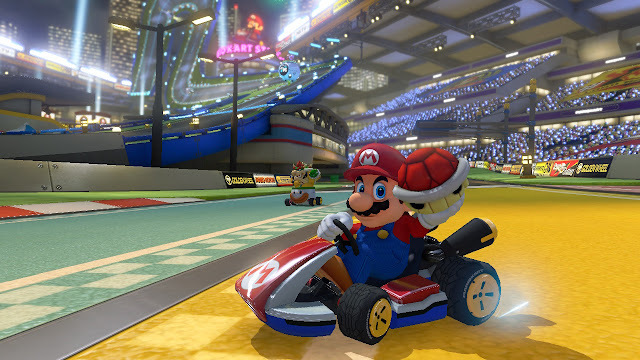 See how awesome you are, Mario Kart 8 Deluxe!) 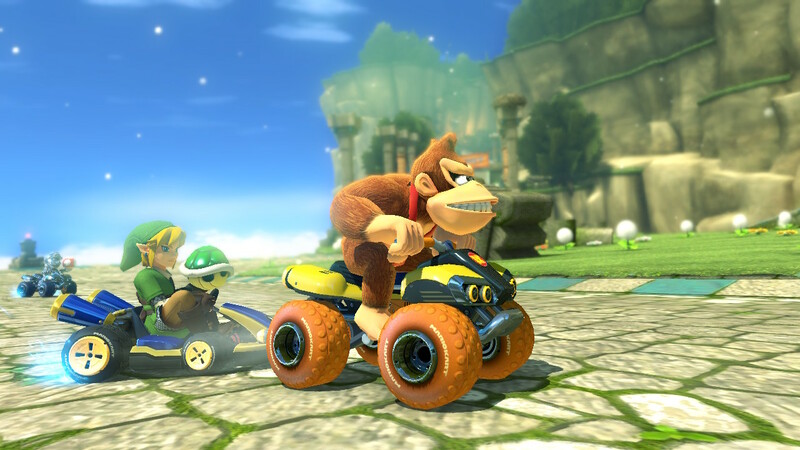 Containing all of the tracks both base and DLC from Mario Kart 8, the aforementioned bigger and better Battle Mode, and more characters than you can shake a stick shift at, and you have the definitive Mario Kart experience--and one of the best kart racing games of all time. We go from the definitive Mario Kart to the definitive Super Smash Bros. Super Smash Bros. 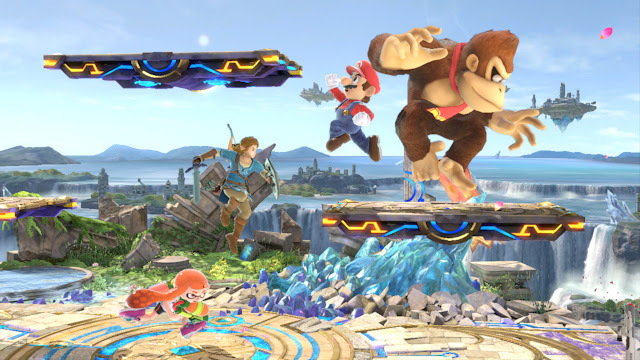 Ultimate contains over 70 characters in its rosters--literally EVERYONE is here--and the majority of stages featured in past Super Smash Bros. games--that's over 100 stages to smash on. 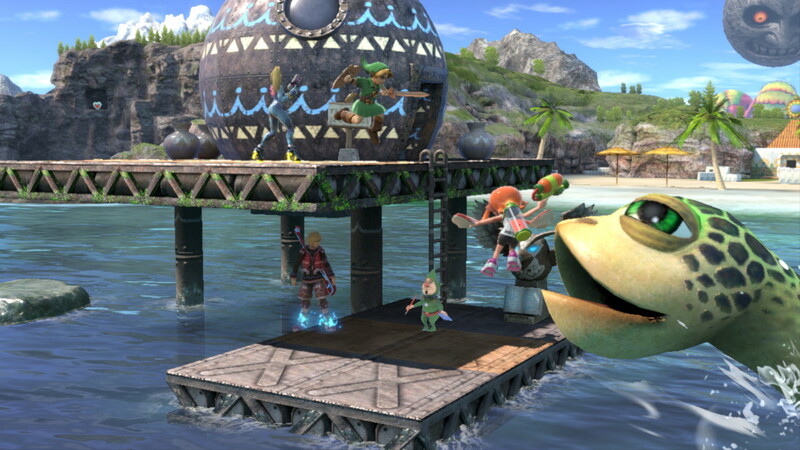 The brand new World of Light mode with over 1200 unique character and object spirits to collect to power up your fighters is my personal favorite single player campaign implementation in the series yet, and the other assortment of modes and features within Ultimate are nothing to whiff at either! This is definitely the ultimate Super Smash Bros. experience, and Masahiro Sakurai and his team aren't pleased to be finished there, as DLC soon drops this April featuring Joker from Persona 5. Since The Legend of Zelda: Breath of the Wild is also available on the Wii U, that leaves us with SuperPhillip Central's second favorite Nintendo Switch game as the number one exclusive on this list. Returning to the open sandbox worlds as seen in Super Mario 64 and Super Mario Sunshine, the massive platforming playgrounds available to Mario are some of the best levels ever seen in the 30+ year franchise. The exhaustive amount of mobile options allowed to Mario make the portly plumber the most nimble he's been in quite some time. 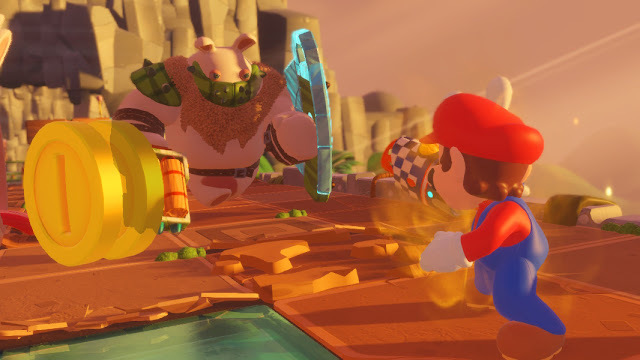 The new capture ability allows for even more unique gameplay scenarios, as Mario inhabits the bodies of enemies and objects, using their abilities to progress in levels and solve puzzles. 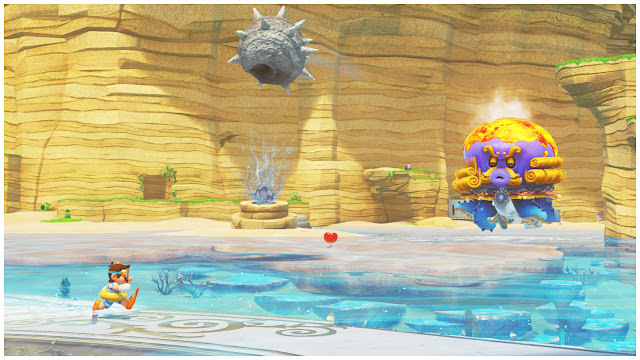 The gargantuan amount of Power Moons featured in Super Mario Odyssey mean that any player can get the requisite amount necessary to proceed through the game, but for completionists and players who want a stiffer challenge, then they can go after all of the Moons--or at least the more difficult to acquire ones. Regardless of your skill level, it's hard not to be wowed by the magic that is Super Mario Odyssey, SuperPhillip Central's pick for best Nintendo Switch exclusive.